A cheesecake made with the "real McCoy". 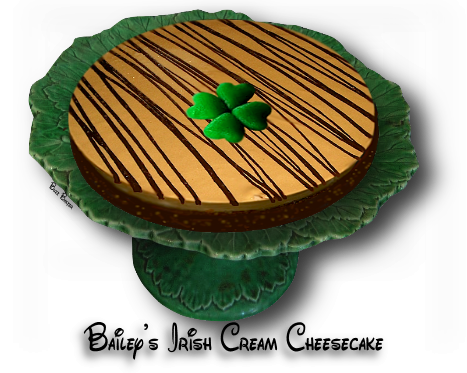 Not an authentic Irish cheesecake, but I'm sure I'm sure that no one will complain! 1. Preheat oven to 350°F. Finely grind graham crackers in processor. at a time, beating just until combined. Mix in remaining ingredients. and bake for 30 more minutes. Run sharp knife around pan sides to loosen cake. Cool. Chill overnight. 1. Bring cream to a simmer in a heavy medium saucepan. Reduce heat to low. 2. Add chopped chocolate and stir until melted and smooth. Cool glacè to lukewarm. cheesecake, spreading with a spatula to cover top and sides and allowing excess to drip on to cookie sheet. Refrigerate until glacè sets, about 30 minutes. 4. Transfer cheesecake to platter and garnish with chocolate curls or decorate to your liking.